China launched its first homegrown 10,000-ton class missile destroyer in Shanghai on Wednesday, a milestone in China's navy development, experts said, adding this shows China has caught up with US destroyers. The PLA Daily reported that the launch of the new missile destroyer was held on Wednesday at the Jiangnan Shipyard in Shanghai under the China State Shipbuilding Corporation. Zhang Youxia, a member of the Communist Party of China Military Central Committee and head of the CMC Equipment Development Department, attended the ceremony. This is China's first homegrown 10,000-ton class missile destroyer with advanced anti-aircraft, anti-missile, anti-vessel and anti-submarine capabilities, and a symbol of the Chinese navy's strategic transformation, the report said. The vessel is expected to undergo equipment testing and sea trials. The PLA Daily's report didn't mention the name or type of the destroyer. But according to previous reports and experts' analysis, it might be a Type 055 guided-missile destroyer and a crucial part of China's future aircraft carrier strike group. The destroyer will greatly enhance the PLA Navy's combat and ground attack capabilities, as its higher displacement will give it greater versatility, military expert Song Zhongping told the Global Times. More importantly, the Type 055 destroyer will form China's anti-missile system together with the 052D destroyer, which has been commissioned. China will be able to build a Chinese version of the Aegis missile defense system with the inclusion of the Type 055, Song said. 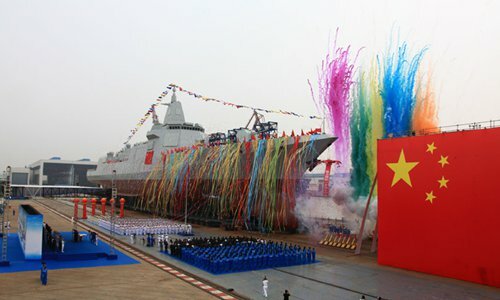 "There is no denying that the Type 055 has a better combat capability than the US Navy's Arleigh Burke-class Aegis destroyer in several areas, and its main mission is to protect large surface vessels like an aircraft carrier and amphibious transport dock," Beijing-based naval expert Li Jie said. The Type 055's advanced active phased array radar system and big displacement allows it to carry more missiles for different missions and gives it a greater strike capability, especially for ground attacks, than the US Arleigh Burke-class, Li said. "We can confidently say that, as far as destroyers are concerned, there is no generation gap between China and the US anymore," Li added. No official data is available on the Type 055's displacement and armament, but Chinese and foreign military media say the new destroyer's displacement is about 10,000-13,000 tons with over 100 vertical launch cells. However, Li stressed that the US still has the upper hand. "The US naval combat system is more comprehensive, and its most advanced destroyer, the Zumwalt class DDG-1000 (still undergoing testing, launched in 2013 with a 15,906-ton displacement) has better stealth capabilities and a radar system."